Complete Drone Attacks in Pakistan Essay as Every morning newspaper has a headline of Drone attacks in Pakistan. This is a very hot debate to discuss the reasons, factors behind this and obviously, organizations involved in it. It is a crucial topic to be discussed but obviously, it has its prominence. Following the occurrence of 9/11 event the United States government blamed Taliban for the incident and had decided to initiate war against terrorism. For this purpose, they have started war against Taliban in Afghanistan. US government required support from Pakistan for giving them the platform for which Pakistani Officials granted the permission. The US military and air forces were given authorization to use Pakistani air bases. Originally, these bases were supposed to be used against the Taliban in Afghanistan but later on US Central Intelligence Agency started to targeted Pakistani citizens of Northwest Pakistan. Drone Attacks in Pakistan Essay are done by United States against the terrorism. The United States government has prepared thousands of attacks targeting northwest Pakistan which was initiated in 2004 using drones. Drone are basically unlabeled aerial vehicles which are being controlled by the American Central Intelligence Agency’s Special Activities Division. Federally Administered Tribal Areas (FATA) along the Afghan border in Northwest Pakistan are targeted for drone attacks to finish terrorism. These strikes were instigated by President George W. Bush and got ignition considerably under President Barack Obama leadership. These series of attacks are also labeled as “drone war” which is against terrorist. Many surveys have shown that the strikes are severely disliked in Pakistan because of casualties of innocent people and destroyed their life, which created to have a negative perception about United States. There is an argument regarding the number of civilian and militant casualties done by these Drone Attacks in Pakistan. It is projected that 286 to 890 civilians have been killed, counting 168 to 197 innocent children. Amnesty International discovered that majority of these victims were unarmed which gives evidence that they were guiltless people. These strikes had forced blameless and innocent people to get the arms for their protection. In addition, this increased to war crimes. Pakistan’s Prime Minister, Nawaz Sharif, has constantly demanded United States government to bring an end to the strikes. He stated that “the use of drones is not only a continual violation of our territorial integrity but also detrimental to our resolve and efforts at eliminating terrorism from our country”. The Peshawar High Court has declared these attacks are unlawful, cruel, violate the UN charter on human rights and encouraging a war crime. The Obama administration differs in opinion, stating that the attacks do not disrupt international law, and that the process of attack is specific and effective. United States government is point of view that by Drone Attacks in Pakistan will eliminate the terrorism but this is actually spreading it whose cohesive reaction can be observed in Pakistan by increased rate of terrorism in the country. Please see the US Drone Attacks in Pakistan Essay Statistics approximation according to the New America Foundation. While drones played only a marginal role under the Bush administration, they have become the weapon of choice since Obama came into office. Under his aegis the number of drone strikes has risen exponentially not just in declared war zones, such as Afghanistan and Iraq, but also increasingly in countries such as Somalia, Yemen and, of course, Pakistan. Against this background, this essay will critically assess the political and societal impacts of the US drone campaign on Pakistan. It is divided into four parts. The first part will briefly outline the historical and political context of the program in Pakistan, stressing both its magnitude as well as the fact that information about it is hard to verify due to the secrecy surrounding it. The second part will then sketch out its domestic and international criticism. It will outline the main arguments brought forward against it, namely, that it radicalises the Pakistani public, leads to a rise in anti-American sentiments and creates a rift between the two allies. Having done so, the third part will challenge these assumptions by illustrating that the widespread ignorance about the drone campaign casts doubt about any alleged tendency of the Pakistani public towards radicalisation. Furthermore, it will be argued that for this very reason, the attacks have only marginally contributed to a rise of anti-American sentiment, which should be understood in a historical, rather than drone-related context. Having briefly outlined the socio-economic structure of Pakistan, as well as the role of American aid, the impact of the drone campaign on the political elite will be evaluated. It will be that such an analysis allows only for the conclusion that despite official denial, Pakistan’s ruling elites have so far tolerated, if not welcomed, US intervention in their country. Finally, the findings will be summarised and it will be concluded that considering the widespread ignorance about the campaign and the collusion of the political elite, the societal and political impact of American drones over Pakistan has not been as profoundly negative as often portrayed. Ever since General Musharraf was threatened after 9/11 that his nation would be ‘bombed back to the stone age’ (Goldenberg, 2006) if he did not align with the United States, Pakistan has become a reluctant ally in America’s global war on terror. In the course of it 49,000 (plus) Pakistanis have lost their lives in terror-related violence (Dawn, 2014), while their country remains to be seen as the breeding ground for global Jihadists. Politically, both countries witnessed a change in their respective governments. In Pakistan the military rule has been abolished and Pakistanis, for the first time in their nation’s crisis-prone history, oversaw a peaceful transition from one democratically elected government to another. In the meanwhile, President Bush handed over the keys to the White House to his successor Barack Obama, who promised to conduct ‘a counterterrorism campaign that would be more morally acceptable, more focused and more effective’ (McCrisken, 2011, 781). His preferred instrument to achieve this goal in Pakistan has been what Pashtun tribesmen call ‘bangana’ (thunderclap), otherwise known as unmanned aerial vehicles (UAVS), or simply drones. Before analysing their impact on Pakistan’s politics and society, however, it needs to be underscored that any assessment of drone warfare in the country has to start by acknowledging a limitation: the drone campaign is run secretly by the CIA, classified under Title 50, which ‘will not be apparent or acknowledged publicly’ (Zenko, 2013). Moreover, the vast majority of US strikes take place in the tribal areas of Pakistan (FATA) near the Afghan border. As the Pakistani constitution does not apply to this area, which is under the rule of the ‘Frontier Crimes Regulation’, no one (not even ordinary Pakistanis unless they have family relations over there) can enter these territories without permission. Hence, official statistics on the total number of drone strikes and civilian deaths are naturally hard to obtain and verify. There are some sources, however, which have been tracking reports of drone strikes despite the absence of transparency. These unofficial reports put the total number of strikes in Pakistan at around 370 to 400, killing an estimated 2000 to 4000 people (New America Foundation, 2015; Serle, 2014a, 2014b). Naturally, such stark figures almost speak for themselves with regards to the impact the campaign must have had on the country. Having said that, it should be added here that the author of this paper has been able to conduct his own field research for the paper during his visit to the country in October 2014. On this basis he can testify that most of the people he interviewed would only talk openly if the conversation would remain off the record – with some notable exceptions (see: Appendix II; III). The very fact that officials, military officers and businessmen would not want to have their opinions written down anywhere already demonstrates the sensitivity and anxiety around the topics of drones in Pakistan. All of this considered, there has naturally been a heated debate in political, academic and military circles both in Pakistan as well as in the West about the societal and political impact of the American drone campaign. One of the strongest notions within this discourse is that the deadly works of Reaper, Predator et al. have radicalised the Pakistani public, increased anti-American sentiment and alienated both allied from another. As Williams, for example, stipulates: ‘Many average Pakistanis see the drones as a humiliating insult to their sovereignty and worry about innocent civilians dying as “collateral damage” in the strikes carried out by a distrusted superpower’ (2010, 887; Appendix IV; see more generally: Appendix II; III). In a similar fashion, Fick testified before congress that the attacks ‘excite visceral opposition across a broad spectrum of Pakistani opinion. The persistence of these attacks on Pakistani territory offends people’s deepest sensibilities, alienates them from their government, and contributes to Pakistan’s instability’ (Senate Committee on Homeland Security and Governmental Affairs, 2009, 2). Drawing on this, the respected anti-terror export David Kilcullen also joins the chorus of critics by stressing his scepticism about American drones patrolling Pakistani skies. He warns that ‘they are deeply aggravating to the population. And they’ve given rise to a feeling of anger that coalesces the population around the extremists (…) [and] is leading us to loss of Pakistani government control over its own population’ (Committee on Armed Services, 2009, 11). Having outlined this, it needs to be added that the majority of assumptions in the West about the views of the Pakistani people are for the most part based on a variety of public opinion polls. Indeed, for Williams ‘no fact more eloquently speaks to their down side [drones]’ (2010, 880) than a poll asserting that ‘ongoing operations by Predator drone aircraft are overwhelmingly rejected (…) 82 per cent called them unjustified’ (Clay, 2009, 8). Yet, the scepticism, if not outright rejection, of the US drone campaign has not been limited to Western commentators alone. In Pakistan there has also been severe official criticism of the program. Foreign ministry spokesman Abdul Basit, for example, lamented in 2010 that drone strikes ‘are counter-productive and also a violation of our sovereignty’ (BBC News, 2010). Similarly, Foreign Minister Khar underlined, that ‘this has to be our war. We are the ones who have to fight against them. As a drone flies over the territory of Pakistan, it becomes an American war again (…) which is imposed on us’ (Asia Society, 2012). All in all, Sajid seems to capture the prevailing sentiment in Pakistan about the American actions when he complains that ‘whatever suits them, they go for it. You are like a tissue paper for them. They use you and throw you away’ (Appendix II, 17). Moreover, Radford also seems to share the same sentiment when he criticises that drone strikes not just ‘undermine host nation governmental legitimacy’ but are also ‘widely perceived as illegal’ (Appendix IV).Admittedly, at first sight all of this casts a very grim picture of the impact drone campaign has had on Pakistan: It appears as if the latest product of the ‘armoury of democracy’ has provided the United States with a hammer that makes every problem look like a nail, whilst she is trying to kill her way to victory in an allied country. Hence, judging from the criticism outlined above, one of the societal impacts the drone campaign seems to be that the drones have created ‘more enemies than it destroys’ (Appendix IV). It thus allegedly helped to create a new enemy, namely the Pakistani public, thereby strengthening an old one, that is, the extremists she seeks to destroy. Besides this, speaking from a political perspective, it could also be concluded that America’s ‘thunderclaps’ have further alienated the Pakistani government and created a rift between the two allies. Yet, the picture that emerges at second glance leads one to question such verdicts. Certainly, the argument of radicalisation has some truth to it. After all, it is hard to imagine that any Pakistani (or any citizen for that matter) reading or hearing about the attacks would welcome another power intervening with force in his or her country, killing a considerable number of civilians. However, this assumption already entails the dilemma. Pakistan is a country of 180m+ inhabitants with an overall literacy rate of 57% (Staff Report, 2014). Against this background, Shakoor sums up the problem when he emphasises that ‘most people in Pakistan are illiterate. They do not watch TV. They do not read newspapers. They just want to make their living. They are very poor. If you get 500 rupees per day and a newspaper costs you 20 rupees, you will not spend it on the newspaper. To rent a house here costs you around 8000 rupees and they spend their 4000 rupees per month to fill their stomach’ (Appendix III, 21). Indeed, such assertions are in line with the author’s own survey conducted on the streets of Islamabad (Appendix I). The results of the latter appears particularly surprising since one would expect ‘ordinary’ Pakistanis living in urban areas with better access to TV, newspapers and the internet, to be more informed about rather spectacular events such as violent interventions by another power. Drawing on this, Fair makes the point that ‘nearly two thirds of Pakistanis have never even heard of the drone program, despite the media coverage it has received in Pakistan and beyond’ (2014, 4). Consequently, it appears that ‘Pakistani public opinion is less informed (…) than is often presumed’ (4). Thus, going back to the earlier quoted statistics showing that a majority of Pakistanis find the drone attacks unjustified, it might be argued that 82 per cent of only one third of the population constitutes a considerable, yet not overwhelming number. Simply put: if people are too busy ‘filling their stomachs’, why should they care for events taking place in distant parts of the country, worry about their nation’s sovereignty, or even read the news at all? Having casted doubt about the notion that drone strikes are ‘deeply aggravating to the population’ (Committee on Armed Services, 2009, 11), the argument of them contributing to an ever-increasing anti-American sentiment in Pakistan’s society remains to be evaluated. Being asked about the background of anti-Americanism in her country, Foreign Minister Khar identified drones as the top cause for the negative, if not hostile, views many of her countrymen have about the United States (Common Dreams Staff, 2012). 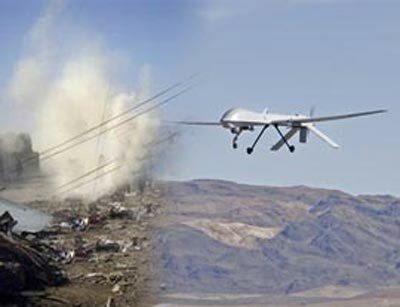 What is more, the famous ‘Living under Drones’ report also asserts that ‘drone strikes breed resentment and discontent toward the US’ (NYU School of Law, 2012, 132; 131-38). To support this claim, it quotes a Pew poll emphasising that Pakistani public opinion is ‘growing ever more critical of the United States’ (Pew Research Center, 2012). By the same token, Bergen warns US authorities that ‘if the price of the drone campaign that increasingly kills only low-level Taliban is alienating 180 million Pakistanis – that is too high a price to pay’ (Bergen, 2012). Yet, such assertions and rather horrifying scenarios also need to be taken with a pinch of salt. Haqqani, for example, points out that there have been efforts in the past on both sides to shape negative public opinions about the other (2013; see: 14, 42, 82, 97, 101, 244, 320). This already indicates that anti-Americanism has been prevalent in Pakistan almost since the beginning of the relationship between the two countries. Moreover, although the first reported drone strike occurred in 2004, the program did not expand significantly until 2008/09 when Obama took office (Amnesty International, 2013, 12; Serle, 2014b; The Bureau of Investigative Journalism, 2015). Having said that, a look at polls taken over the last 12 years clearly demonstrates that Pakistanis seem to have always had a very negative image of the United States – whether there have been drones flying over their territory or not (Pew Research Center, 2002; 2005; 2007; 2009; 2013). Furthermore, their negative view about the US did not change substantially for the worse after the drones started flying, which might stand in a direct relationship with the widespread ignorance about the campaign itself. Against this background, an analysis of the role Pakistani political elite has played in this game of power and knowledge appears to be of particular importance. Even without drawing on classical works on the role of elites in political systems such as Mill’s ‘Power Elite’ (1956), or Amsden’s latest work on how elites shape economic development (2012), it should be clear that the fate of Pakistan’s 180m inhabitants is heavily influenced, if not totally determined, by its ruling classes. In fact, the picture of the socio-economic system of Pakistan that emerges out of a brief analysis through the lenses of political economy starkly resembles that of a Marxian pyramid. As Gosh highlights, only 5 per cent of the population control almost two-thirds of its farmland – a stunning figure for a country that runs on an agricultural economy, which generates 25 per cent of its GDP, 60 per cent of its export earnings and 48 per cent of employment (Ghosh, 2011). This, together with rampant corruption, has only contributed to an ever-widening gap between ‘haves’ and ‘have-nots’ and a concentration of wealth and power in politics and the military establishment (Burki, 2011; Haq, 2013; Transparency, 2015). Having been the central pillar of the political system since the birth of the country, the latter in particular wields enormous influence and power. It receives an awesome 25 per cent share of the budget, whilst education is granted only 2.3 per cent (Federal Budget, 2013; Pakistan Today, 2013; Siddique, 2011). Moreover, in this regard one must not forget that it takes two to tango: the country’s political-economic system has been ‘subsidised’ with 28bn dollars of US aid since 2001 of which the greatest part has been fuelled into Pakistan’s vast machinery of defence (Ratnam, 2014). On top of that, it also depends on loans from the American-dominated IMF to avoid economic turmoil and push through reforms (IMF, 2013; Reuters, 2014). What thus comes to light is the image of a garrison state resembling a hybrid version of feudalism and capitalism whose relations with its most powerful ally might be summed up by the old saying ‘He who pays the piper calls the tune’. It is against this rather cynical cycle of dependence and Realpolitik that one must look at the aforementioned official Pakistani criticism of the drone campaign. Indeed, a closer analysis lays bare the double game played on the stage of Pakistani politics. The script seems to have been written by Machiavelli himself, who famously asserted that ‘it is necessary to know well how to disguise (…) and to be a great pretender and dissembler; and men are so simple (…) that he who seeks to deceive will always find someone who will allow himself to be deceived’ (1515, 84). Rather unsurprisingly, recent Wikileaks cables showed that while officials protested publically against drones, they welcomed them privately, or even asked for an increase in strikes (Ferran, 2011). Surely, playing Dr. Jekyll and Mr. Hyde appears not to be that difficult for the governing circles considering the widespread ignorance about the programme. Former Prime Minister Gilani sums up the attitude when he asserted: ‘I don’t care if they do it as long as they get the right people. We’ll protest in the National Assembly and then ignore it’ (The Guardian, 2010; see also: BBC News, 2013). Besides, it is also crucial to realise that although Musharraf ruled the country with dictatorial decree until 2008, the indifference towards drones has not stopped with the end of his rule. Hence, judging from Giliani’s words and America’s deeds, the drone campaign has not had a crucial impact on Pakistani politics beyond mere official rhetoric – despite the dawn of democracy. Having recognised that only a small fraction of the Pakistani people do in fact know about the program and that anti-Americanism has deep roots and a long history in Pakistan, it might ultimately be concluded that the political and societal impact of the US drone campaign has not been as profoundly negative as commonly assumed. Yet, this is not to say that there has not been any effect at all. Surely, the minority of ‘average’ Pakistanis who have heard of the attacks are vehemently opposed to it. However, their number does arguably not seem to be high enough to ‘make a difference’ and pressure the political elites to seek a change in policy. Finally, whether one calls it active collusion or grudging acceptance in the face of an economic and military dependence on the United States, it remains a fact that the Pakistani elite – authoritarian or democratic – has played a double game in all this. Yet, with drone attacks more or less stopping during most of 2013 and an army offensive into the tribal areas, it remains to be seen what political impact the US-made thunderclaps will have on the Sharif government. If history is a parameter, however, the old pattern appears very likely to repeat itself. Amnesty International. (2013). “Will I be next?” US Drone Strikes in Pakistan. [online] London: Amnesty International Publications. Available at: http://www.amnesty.org/ar/library/asset/ASA33/013/2013/en/041c08cb-fb54-47b3-b3fe-a72c9169e487/asa330132013en.pdf [Accessed 18 Jan. 2015]. Amsden, A., DiCaprio, A. and Robinson, J. (2012). The role of elites in economic development. Oxford: Oxford University Press. Asia Society. (2012). Watch: Pakistan FM Calls Drone Strikes ‘Illegal,’ Says ‘This Has to Be Our War’. [online] Available at: http://asiasociety.org/blog/asia/watch-pakistan-fm-calls-drone-strikes-illegal-says-has-be-our-war [Accessed 16 Jan. 2015]. BBC News. (2010). Pakistan condemns US drone hits. [online] Available at: http://www.bbc.co.uk/news/world-south-asia-11490722 [Accessed 16 Jan. 2015]. BBC News. (2013). Pakistan ‘endorsed US drone strikes’. [online] Available at: http://www.bbc.co.uk/news/world-asia-24649840 [Accessed 23 Jan. 2015]. Bergen, P. (2012). Drone is Obama’s weapon of choice – CNN.com. [online] CNN. Available at: http://edition.cnn.com/2012/09/05/opinion/bergen-obama-drone/ [Accessed 18 Jan. 2015]. Burki, S. (2011). How rich are the Pakistani rich? – The Express Tribune. [online] Tribune.com.pk. Available at: http://tribune.com.pk/story/169144/how-rich-are-the-pakistani-rich/ [Accessed 21 Jan. 2015]. Clay, R. (2009). Pakistani Public Opinion on the Swat Conflict, Afghanistan, and the US. [online] WorldPublicOpinion.org. Available at: http://www.worldpublicopinion.org/pipa/pdf/jul09/WPO_Pakistan_Jul09_rpt.pdf [Accessed 15 Jan. 2015]. Committee on Armed Services. (2009). Effective Counterinsurgency: The Future of the U.S.- Pakistan Military Partnership. Washington: U.S. Government Printing Office, p.11. Common Dreams Staff. (2012). Pakistan Foreign Minister: Drones Are Top Cause Of Anti-Americanism. [online] Available at: http://www.commondreams.org/news/2012/09/28/pakistan-foreign-minister-drones-are-top-cause-anti-americanism [Accessed 18 Jan. 2015]. Dawn.com. (2014). ‘Pakistan suffered heavy losses in fighting war on terror’. [online] Available at: http://www.dawn.com/news/1149002 [Accessed 3 Apr. 2015]. Fair, C., Kaltenthaler, K. and Miller, W. (2014). Pakistani Opposition to American Drone Strikes. Political Science Quarterly, 129(1), pp.1-33. Federal Budget. (2013). [online] Islamabad: Government of Pakistan Finance Division, p.6. Available at: http://www.finance.gov.pk/budget/Budget_in_Brief_2013_14.pdf [Accessed 23 Jan. 2015]. Ferran, L. (2011). WikiLeaks: Pakistan Asked for More, Not Fewer Drones. [online] ABC News. Available at: http://abcnews.go.com/Blotter/wikileaks-cable-pakistan-asked-fewer-drones/story?id=13647893 [Accessed 23 Jan. 2015]. Goldenberg, S. (2006). Bush threatened to bomb Pakistan, says Musharraf. [online] the Guardian. Available at: http://www.theguardian.com/world/2006/sep/22/pakistan.usa [Accessed 16 Jan. 2015]. Ghosh, P. (2011). Give Me Land, Lots Of Land: Only 5% Of Pakistanis Own Two-Thirds of Farmlands; One-Half Of Farmers Are Landless. [online] International Business Times. Available at: http://www.ibtimes.com/give-me-land-lots-land-only-5-pakistanis-own-two-thirds-farmlands-one-half-farmers-are-landless [Accessed 23 Jan. 2015]. Haq, I. (2013). The great divide – Dr Ikramul Haq. [online] The News International, Pakistan. Available at: http://www.thenews.com.pk/Todays-News-9-211140-The-great-divide [Accessed 21 Jan. 2015]. Haqqani, H. (2013). Magnificent Delusions: Pakistan, the United States, and an Epic History of Misunderstanding. New York: Perseus Books Group. IMF. (2013). IMF Survey : Pakistan Gets $6.6 Billion Loan from IMF. [online] Available at: http://www.imf.org/external/pubs/ft/survey/so/2013/car090413a.htm [Accessed 23 Jan. 2015]. Machiavelli, N. (1515). The Prince. [online] Constitution.org. Available at: http://www.constitution.org/mac/prince.pdf [Accessed 23 Jan. 2015]. McCrisken, T. (2011). Ten years on: Obama’s war on terrorism in rhetoric and practice. International Affairs, 87(4), pp.781-801. New America Foundation. (2015). Drone Wars Pakistan: Analysis. [online] Available at: http://natsec.newamerica.net/drones/pakistan/analysis [Accessed 15 Jan. 2015]. NYU School of Law., Stanford Law School. (2012). [online] New York: International Human Rights and Conflict Resolution Clinic at Stanford Law School and Global Justice Clinic at NYU School of Law. Available at: http://www.livingunderdrones.org/wp-content/uploads/2013/10/Stanford-NYU-Living-Under-Drones.pdf [Accessed 18 Jan. 2015]. Pakistan Today. (2013). Pakistan allocates only 2.3 percent of budget for education. [online] Available at: http://www.pakistantoday.com.pk/2013/01/14/city/karachi/pakistan-allocates-only-2-3-percent-of-budget-for-education/ [Accessed 22 Jan. 2015]. Pew Research Center for the People and the Press. (2002). What the World Thinks in 2002. [online] Available at: http://www.people-press.org/2002/12/04/what-the-world-thinks-in-2002/ [Accessed 18 Jan. 2015]. Pew Research Center’s Global Attitudes Project. (2005). How the United States is Perceived in the Arab and Muslim Worlds. [online] Available at: http://www.pewglobal.org/2005/11/10/how-the-united-states-is-perceived-in-the-arab-and-muslim-worlds/ [Accessed 18 Jan. 2015]. Pew Research Center’s Global Attitudes Project. (2007). Musharraf’s Support Shrinks, Even As More Pakistanis Reject Terrorism… and the U.S.. [online] Available at: http://www.pewglobal.org/2007/08/08/pakistanis-increasingly-reject-terrorism-and-the-us/ [Accessed 18 Jan. 2015]. Pew Research Center’s Global Attitudes Project. (2009). Pakistani Public Opinion. [online] Available at: http://www.pewglobal.org/2009/08/13/pakistani-public-opinion/ [Accessed 18 Jan. 2015]. Pew Research Center’s Global Attitudes Project. (2012). Pakistani Public Opinion Ever More Critical of U.S.. [online] Available at: http://www.pewglobal.org/2012/06/27/pakistani-public-opinion-ever-more-critical-of-u-s/ [Accessed 18 Jan. 2015]. Pew Research Center’s Global Attitudes Project. (2013). What Pakistan Thinks. [online] Available at: http://www.pewglobal.org/2013/05/10/what-pakistan-thinks/ [Accessed 18 Jan. 2015]. Ratnam, G. (2014). Pakistan to Seek Continued U.S. Funds to Combat Terror. [online] Bloomberg. Available at: http://www.bloomberg.com/news/2014-07-16/pakistan-to-seek-continued-u-s-funds-to-combat-terror.html [Accessed 23 Jan. 2015]. Reuters. (2014). Pakistan reforms on track, extra $1.1 billion likely: IMF official. [online] Available at: http://www.reuters.com/article/2014/10/12/us-imf-economy-pakistan-idUSKCN0I10PV20141012 [Accessed 23 Jan. 2015]. Senate Committee on Homeland Security and Governmental Affairs. (2009). From Strategy to Implementation: Strengthening U.S.-Pakistan Relations. Prepared Statement of Nathaniel C. FIick Chief Executive Officer Center for a New American Security. Washington: Subcommittee on Federal Financial Management, Government Information, Federal Services, and International Security, p.2. Serle, J. (2014a). More than 2,400 dead as Obama’s drone campaign marks five years | The Bureau of Investigative Journalism. [online] Thebureauinvestigates.com. Available at: http://www.thebureauinvestigates.com/2014/01/23/more-than-2400-dead-as-obamas-drone-campaign-marks-five-years/ [Accessed 15 Jan. 2015]. Serle, J. (2014b). Interactive timeline: 10 years of drone strikes in Pakistan | The Bureau of Investigative Journalism. [online] Thebureauinvestigates.com. Available at: http://www.thebureauinvestigates.com/2014/06/18/interactive-timeline-10-years-of-drone-strikes-pakistan/ [Accessed 15 Jan. 2015]. Siddique, A. (2011). Pakistan: Armed With Power, Perks, And Privileges. [online] RadioFreeEurope/RadioLiberty. Available at: http://www.rferl.org/content/pakistani_military_is_armed_with_power_perks_and_privileges/24215518.html [Accessed 22 Jan. 2015]. Staff Report. (2014). Adult literacy rises to 57 percent, Punjab tops, Balochistan at rock bottom in literacy. [online] Available at: http://www.pakistantoday.com.pk/2014/04/04/national/adult-literacy-rises-to-57-percent-punjab-tops-balochistan-at-rock-bottom-in-literacy/ [Accessed 17 Jan. 2015]. The Bureau of Investigative Journalism. (2015). All Estimated Casualties in Pakistan by Year. [online] Available at: http://www.thebureauinvestigates.com/wp-content/uploads/2012/07/All-Totals-Dash54.jpg [Accessed 18 Jan. 2015]. The Guardian. (2010). US embassy cables: Pakistan backs US drone attacks on tribal areas. [online] Available at: http://www.theguardian.com/world/us-embassy-cables-documents/167125 [Accessed 23 Jan. 2015]. Transparency. (2015). How corrupt is your country?. [online] Available at: http://www.transparency.org/cpi2013/results [Accessed 23 Jan. 2015]. Williams, B. (2010). The CIA’s Covert Predator Drone War in Pakistan, 2004–2010: The History of an Assassination Campaign. Studies in Conflict & Terrorism, 33(10), pp.871-892. Zenko, M. (2013). Transferring CIA Drone Strikes to the Pentagon. [online] Council on Foreign Relations. Available at: http://www.cfr.org/drones/transferring-cia-drone-strikes-pentagon/p30434 [Accessed 15 Jan. 2015]. Note: The author would like to stress that a large part of the research for this essay has been conducted in Pakistan itself during a research visit in October 2014, which was fully funded by the government of Pakistan. The primary purpose of the visit was to enable the author to present the findings from his Warwick Undergraduate Research Support Scheme (URSS) on “Food Security in Pakistan”, which he carried out in the summer of 2014. However, during his visit the author also tried to talk to as many people as possible about the topic of this essay and ultimately weave their insights into the overall evaluation presented in the essay. Furthermore, the author considers it necessary to underline that most of the people he interviewed would only talk openly and freely if the conversation would remain off the record. Nevertheless, the insights from these conversations have still found their way into the essay. The very fact that officials, military officers and businessmen would not want to have their opinions written down anywhere already stands as an argument in itself and demonstrates the sensitivity and anxiety around the topics of drones in Pakistan. Appendix I – Survey conducted on drone attacks among citizens of Islamabad. With the generous help of an interpreter, the survey was carried out on the streets of Islamabad on October 16, 2014 during the author’s field research for this essay and other papers. Adhering to both the spirit and the law of Warwick’s ‘Research Code of Practice’, those polled were chosen randomly and the purpose and goal of the investigation were clearly outlined to them. Have you heard about the American drone strikes taking place in Pakistan? If so, do you think they are being carried out with the approval of the government of Pakistan? Do you think America should support Pakistan in fighting the Taliban and other insurgents? Raje Sajid is an Islamabad-based businessman whose companies are mainly involved in construction and land development. Because of his close ties with the Pakistani armed forces, in which Mr. Sajid takes great pride, the interview was held on October 12, 2014 at his home in the district of the Army Combatant General Headquarters (GHQ) in Rawalpindi. Mr. Sajid, how does the “average Pakistani” think about the American drone campaign in Pakistan? What impact does it have on people? How do they talk about it? In the US , yes. I think the US was not very just in it. They have been doing whatever they want. They have been playing a double-game and treated Pakistan very badly: They did not take Pakistan into the conflict and there was a blame game going on all the time. So I do not think that the drones helped Pakistan. So you think that Pakistan should conduct this war itself? This is what the Pakistani army is doing right now and it is doing it very effectively! So Pakistan could have done it much better earlier if it had been involved in the American decision-making process. Would you go as far as to claim that the drone campaign is a deliberate attempt by the US to destabilise the country? Especially because Pakistan is getting closer and closer to China and is in fact drifting away from the US camp? Yes, it is! The Pakistani-Chinese relationships are getting stronger day by day and the Chinese interest is very immanent in Pakistan, for instance if you look at Gwadar. The road that is being built from Gwadar to China, the pipeline…it is all being funded by the Chinese government. Gwadar suits China and not the US. I remember watching an interview with General Musharraf who told the audience that the day after 9/11, Colin Powell or Richard Armitage called him and threatened him that if Pakistan would not comply with US demands, America would “bomb Pakistan back to the Stone Age”…. …do you think that there has been a shift away from that with the new US President, Barack Obama, in office? Yes. You see when General Musharraf was in power he allowed all things do be done – no matter whether they were right or wrong – and did whatever the Americans wanted him to do and no one could stop them. But Americans keep shifting their policies. Whatever suits them, they go for it. You are like a tissue paper for them. They use you and throw you away. This is what they did to Pakistan and this is also what they are doing to Afghanistan. They are leaving now, but they really should not. They are leaving both Pakistan and Afghanistan in very insecure states, especially when it comes to the border region. They are leaving behind a chaos. So you could say that people are very hostile to the United States because of the drone campaign and because of the assassination of bin Laden as well…? No. Not because of bin Laden. It is the drones that has damaged the relationships between us and the Americans. The killing of bin Laden affected the relationship a little bit, but not so much as the drone campaign did and still does. Look at North Waziristan and the Tribal Areas: So much collateral damage has been done. So many innocent people have died. Siblings have suffered. Wives have suffered. Husbands have suffered. Entire families have disappeared. That used to be the case, but it is no longer. Furthermore, it did not bring them good results. Yes. But, you know, the Americans are an arrogant people. They should have involved the Pakistani government in their campaign and should have at least tried to explain their actions to the general public – with the support of the Pakistani government. Is there a sense of powerlessness and humiliation among the Pakistani people that the US is basically just doing whatever she wants? Very true! Especially in these times! We have a unique historical situation now in Pakistan. For the first time in the history of our country there has been a successful and peaceful transition from one elected government to another. So democracy is taking hold in Pakistan. Yet, at the same time the United States is destabilising the country. So the US is not promoting democracy, as it always says, but, on the contrary, is rather taking measures to prevent democracy from spreading in Pakistan. And it is not just democracy. It is also corruption. If America was genuinely interested in helping Pakistan and reducing the threat from the Taliban it should focus on these issues. Instead it is wielding its immense power in a way that is not beneficial to its own cause and objectives. Let me tell you another very important thing: the drone campaign and its portrayal in the media has created a terrible image of Pakistan. People think that everyone in Pakistan is a terrorist and I bet you that some of your friends in the West advised you not to go to Pakistan because they have this distorted image of Pakistan in their minds. There is an anti-Pakistan campaign going on in all the media. But when you come to Pakistan, the reality is totally different. But obviously there is a purpose behind portraying Pakistan in that way. With all these negative discourses we will never ever be able to promote tourism here in Pakistan just like India has managed. With all this it is getting harder to attract developmental aid to the country, it is getting harder for countries to show interest in Pakistan. So to come back to your original question: The impact the American drone campaign has had on Pakistan is devastating for both sides and both sides have suffered as a result of it. Thank you very much for your time and help, Mr. Sajid. Mr. Abdul Shakoor is the Managing Editor of Daily Jinnah News, a major Pakistani news agency. The interview was held on October 24, 2014 in his house in Islamabad. Mr. Shakoor, what do you think have been the societal and political impacts the US drone campaign has had in Pakistan? How has it affected Pakistani politics and the society as a whole? You know, the drones started flying under the government of General Musharraf, he was a military dictator. Today’s government has been democratically elected and they do not like the drone attacks. The government today really wants to do something against the drone attacks. But the Americans are saying that they had an agreement with Pakistan, agreed to under Musharraf. And the current government really wants no war at all. The government wants to end this conflict with an agreement between Pakistan and those, who you call terrorists. The old government under Musharraf, who was President and PM at the same time, together with the army did whatever the Americans wanted them to do. There was no democracy. Now we have democracy but the drones are still affecting democracy in Pakistan. Interestingly though…when General Musharraf was in office here in Pakistan, President Bush was President of the United States. However, the governments of both countries changed and with Obama as the new head of state, the drone attacks rapidly increased…and we had a democratically elected government in Pakistan. So does it really matter what form of government you have in Pakistan? It looks as if the strikes would be carried out anyway…In fact there is an argument that basically states that consecutive Pakistani government would publicly denounce the strikes, yet privately welcome them…what do you make of this? This is not correct! Look, the main issue is that Pakistan is a nuclear power! Pakistan is the only Muslim country that has nuclear weapons! That is the true reason why America is saying that Pakistan is a terrorist country. Afghanistan is the terrorist country, they have more terrorists than us! And all the European countries believe America, they all believe Pakistan is a terrorist country! But Pakistan is a very peaceful country! America opened the borders to Afghanistan and it is a very long border… 600km! And this shifted all the terrorists into Pakistan from Afghanistan. But the main issue is the nuclear weapons! Before we tested our first atomic bomb there was no issue with terrorism and all this. There were no drones. But after that America started to portray Pakistan as a terrorist country. …so basically you are saying that the United States is trying to portray Pakistan in such a light because it has nuclear weapons, which it should not have…Okay…so would you go as far as to claim that these drone strikes are a deliberate attempt to destabilise the country? Yes! I agree 101%! This is not just my personal opinion! All Pakistani people believe this! America is afraid that Pakistan is giving its atomic power to other Muslim nations like Iran, Saudi Arabia…and it is not just the Americans! Other European countries are also afraid! But Islamic countries are very peaceful. They would never do the first step! The others do it! The Americans are disturbing Pakistan with its drones, they want that people think of Pakistan as a terrorist nation and that it is not safe to go to Pakistan. America wants to take away the nuclear weapons from Pakistan. Interesting…you know I conducted a survey earlier this week. I walked around with a translator and was asking people on the streets in Islamabad, whether they had heard about the drone strikes and 70% of the 55 people I asked had not even heard about drone strikes in Pakistan. Why do these people not know about it? You know…most people in Pakistan are illiterate. They do not watch TV. They do not read newspapers. They just want to make their living. They are very poor. If you get 500 rupees per day and a newspaper costs you 20 rupees, you will not spend it on the newspaper. To rent a house here costs you around 8000 rupees and they spend their 4000 rupees per month to fill their stomach! Sharif seems to be very pro-China…Do you think the drone strikes have damaged Pakistan’s relationship with the United States so severely that Pakistan is now allying with China even more closely and leaves America behind? America always tries to buy the whole government. But whether America can spend millions and billions of dollars, they will never be able to buy the people of Pakistan. They can buy the government, but not the people. America spends so much money on the governments that they depend on them. But now is the time, with the new government that the Pakistani government and the Pakistani people are the same thing. The governments used to close their eyes in the face of the American drone attacks. But now the time has come that the government will no longer close its eyes! There has now been a stop in drone strikes. In the year 2014 there has been a significant decrease in US drone strikes. At the time, the Pakistani army is carrying out a military operation against the Taliban…is not the army doing the job on behalf of America, for America? In Waziristan you have a lot of people coming from Chechnya, Afghanistan, Uzbekistan. They were all coming over the border and in some parts of Waziristan…we are not doing this on behalf of America, we are doing it because of the people who crossed the border. So you are saying that the army operation is not related to the drone strikes? No, it is not related to the drone strikes. It is because of the people who are migrating into Pakistan. It is because of Afghanistan. And the weapons they could get hold of in those areas were all made in America, Israel and India. But again: the main issue is the nuclear bomb. If we would not have it, if we would give them to America, we would not have these issues! So America is bossing the other European countries around? Yes. American is telling other European countries to attack Pakistan. Just like America forced them to attack Iraq, Libya and probably soon Iran! America is using all other countries! Why does America not give benefits to other countries? America has been giving weapons to Dubai – a country of 5m people! Why does it have to be American weapons? German weapons are also good! Why did they not allow Germany to supply these weapons? Dubai does not even need weapons! Thank you very much for your time and help, Mr. Shakoor. Appendix IV: Interview Dr. Mark Radford. Dr Mark Radford teaches Modern History for Oxford University Department for Continuing Education. He is a former member of the Regular British Army and Royal Ulster Constabulary, and has recently been granted the rare appointment of Honorary Colonel in the British Army Reserves and Cadets in recognition of his long-standing involvement. His latest work on Irish policing is to be published by Bloomsbury in 2014. The interview was conducted in January 2014. During a speech in 2013, President Obama declared the War on Terror to be over. Was he right? Can a war on Terror ever be won? It was always a mistake to declare war on a noun and Obama rightly recognised that the terminology that his predecessor used was (a) silly (b) counter-productive. In declaring that the war on terror was over he was trying to establish clear blue water between his administration and that of Bush and to indicate that his approach will be different, more nuanced and no longer Manichaean. No. Terror as a tactic of asymmetric warfare is effective and will last as long as war will last. However, historically all terrorist campaigns end, as this presently religiously inspired campaign will, but governments combating terrorism must understand that these are battles of ideas, so the shooting side of the business is less than 25% of the effort. There are those who argue that by the way she is fighting, America has entered a kind of vicious cycle of war, with no other purpose than to eternally perpetuate and fuel itself. Having Eisenhower’s warning about the profit-driven ‘military-industrial complex’ and the ‘revolving door’ between business and politics in mind, I was wondering whether you would as far as to argue that there might even be a political-economic interest behind a further continuation of this war? That is a cynical perspective, but one could mount an industry led argument that war is good for business. Certainly it is in the interests of many in the Senate, Pentagon and the arms industry to inflate the threat from terrorism and insurgency warfare to the US. Judged by its own definition, could we not argue, as Chomsky does, that the US should be considered as ‘the leading terrorist state’? In terms of bald civilian numbers killed Chomsky is undoubtedly correct. However, the stated intention in its declared (or undeclared) war on terror is to conduct it in the name of self-defence. This is allowed in International law and therefore lawful violence. America would argue therefore, that it is not committing terrorist acts. To change the topic slightly and without going into country-specific details…there has been an on-going and indeed ever-expanding US-led drone campaign in places such as Yemen, Somalia and Pakistan. Has the use of drones been overall beneficial to US military and political interests and goals? No. Drones are a tactic in search of a strategy and are merely a technological and tactical substitution for an overarching strategy. US drone policy is counterproductive for 4 main reasons: it creates more enemies than it destroys; undermines host nation governmental legitimacy; sets a highly dangerous precedent for when other nations acquire the weapon; it is widely perceived as illegal. To come to final question: Almost a year has passed since our last interview. Back then, you defined ‘ignorance or disregard of our own cultural and historical foundations’ as ‘the greatest threat’ to the West in the 21st century. Would you still subscribe to this assessment? Yes. The events of 2014-2015 (Charlie Hebdo et al) point up all the dangers in allowing the political dogma of multi-culturalism to supersede or challenge the cultural mores of the Western-Judeo Christian civilisation. Those who emigrate to Western countries must peacefully integrate and not challenge our values. For our part, we need to recognise that post colonial guilt is no longer appropriate and that whilst critical analysis of our past is important, do not, as Clement Atlee once advised, throw the baby out with the bathwater, we have much to be proud of in the Western Civilisation that we have bequeathed to the world.